Our school librarian gets a high demand for books about dragons, especially from the lower grade students. 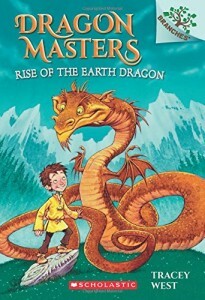 So she and I were delighted to find this children’s first chapter book series, Dragon Masters. It is surprisingly well-done for an early reading children’s book. The story has complexity and interest. At the same time, because it is a children’s first chapter book, there are sufficient illustrations to help with the content. The chapters are a bit longer than other first chapter books, so I would recommend it for stronger readers. It could also work as a read-aloud. The copies I checked out from the library both had nice clear, large print, which for me is a must when I review a children’s first chapter book. The characters in the book are also a nice mix of nationalities and gender, making this an appealing story. The main character is a boy, which is a great plus, when looking to engage young readers. There is at least five books in this series of first chapter books, and I would assume they are very much the same quality. A series is also a great asset to have for young readers, because if they like the first book, they can continue with the others. I give this a thumbs-up for covering all bases.